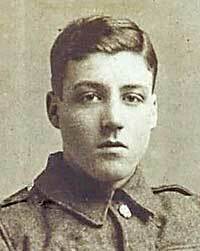 Killed in action by shellfire at St Quentin on Friday 4th October 1918 aged 20. He was also wounded on Saturday 1st July 1916 during the first day of the Somme when the Battalion attacked the Leipzig Salient. "It was as a result of the first appeal to the men of Britain by Lord Kitchener that the 11th (Service) Battalion Sherwood Foresters was formed at Derby on Thursday 17th September, 1914, and the men who were enlisted were largely miners of Nottingham and Derby." For gallantry and devotion to duty when in an attack at San Sisto Ridge, Italy 15.6.1918. He was killed in Action when a Lance Sergeant 4.10.1918, near St. Martin, France. Another M.M. for Belper Man. Sergeant Arthur Varney, Sherwoods, of Field Row, Belper, who is only 20 years of age, was awarded the Military Medal on June 15th for Gallantry in action in Italy during the last push against the Austrians. Varney, who was recently promoted to Sergeant, joined up some 3 years ago when working at Messrs. Brettles and after training proceeded to France where he'd experienced some heavy fighting, particularly in the Somme area. He had been most fortunate in coming out of every ordeal unscathed and in never having been in hospital. He was transferred to Italy some nine months ago and has not been able to obtain leave. His recent letters home have referred to his constant good luck in escaping death and wounds while he also remarks on the Italian hot weather. Other letters received in the town from his comrades state that Varney was decorated with the M.M. on the field. Sergeant Arthur Varney, eldest son of Mr and Mrs Varney, Field Row, Belper is reported by two of his comrades to have been killed by a shell and laid to rest in a military cemetery. No official intimation has been received, though the news arrived from V. Oldknow of Belper and T. Martin from Heage. The deceased, who was just over 20 years of age had won the M.M. and obtained his promotion on the field. He joined Kitchener's Army in 1914 and was drafted to France with the Sherwood's, taking part in the first severe fighting on the Somme. After 2 years in France he was transferred to Italy and was home on leave some nine weeks ago when he returned to France where he met his death. Sergeant Varney was a former employee of Messrs. Brettles. We recently referred to the death of Sgt. Arthur Varney, eldest son of Mr and Mrs Varney of Field Row Belper, whose death was reported by two comrades, one of Heage and the other of Belper. A further letter to the deceased's mother from Lieut. O.R. Orchard dated Oct.16th confirms their statement that Sgt. Varney fell in action on Oct.5th. The deceased joined up voluntarily in 1915 at the age of 17, trained in Kitchener's Army at Brockton and crossed to France in 1916, taking part in the severe fighting on the Somme. Being next drafted to Italy, he fought in several actions on the Piave during 8 months. He came home on leave spending August Bank Holiday with his parents after which he was again drafted to France and was killed by a shell as stated. Deceased was in his 21st year and had been employed at Messrs. Brettles previous to his enlistment. He won the M.M. in June when in Italy, fighting against the Austrians, the ribbon being presented to him by his Commanding Officer. Arthur is buried in the Prospect Hill Cemetery Gouy France. He was awarded the Military Medal on 15th June on the field for gallantry in action fighting the Austrians on the Italian front. Arthur was born in South Wigston, Leicestershire and enlisted in Belper on Sunday 7th November 1915 aged 17 and he was the eldest son of Arthur and Zipporah Varney, (nee Wells) of 4, Field Row, Belper. Before enlisting Arthur worked at Brettles. If you have any information or images for any of the soldiers on this site we would be very interested to here from you, click here to contact us.